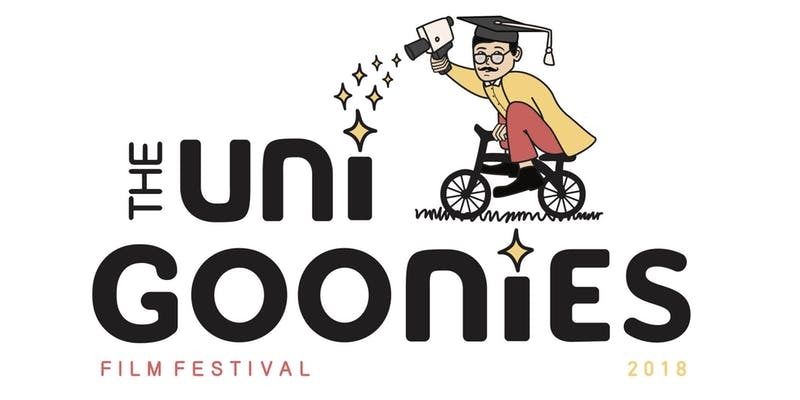 Come and join us at The Uni Goonies Film Festival where we celebrate this year's best-of-the-best short films! Rub shoulders with local film industry guests and celebrities, enjoy the delicious fingerfood and drinks on offer, and watch some of our most talented and upcoming filmmakers win well-deserved awards and prizes. This is a festival made by students, for students (and other young non-professional filmmakers), and you won't want to miss history being made in the making. With up to 7 film submission categories on show at our secret cinema location in the city's centre - including Shorts, Experimentals, and the first ever BlackOut Category for Indigenous filmmakers - this is a night you'll never forget. Get the chance to listen to industry filmmakers, producers, writers, and more, talk about why Western Australia's film industry is the place to be right now! Plus, we'll have representatives from all of our universities and TAFE's on show, proving that our young people's films are what's making our industry buzz with excitement right now. We'd love to share the magic of movies with you as we head towards our Christmas holidays. Don't hesitate and witness it all by buying your ticket today - and attend Western Australia's hottest film festival yet! WHERE: State Library of WA, Theatre. The Uni Goonies Film Festival is proudly sponsored by Healthway, to promote the Drug Aware message, and Propel Youth Arts WA.